Which women do not wish for a beautiful abs and slim body? However, they tend not to attend it because they think that abdominal exercises are the toughest ones. However, that’s just a myth; anybody who is willing to achieve a beautiful abs can easily do abdominal exercises. Even though, there are some crunch exercises which can help you in attending beautiful abs, here are few of the best abdominal exercises to achieve best of the results. This is the simplest exercise for strengthening the abdominal muscles. Here are the steps to execute the same. Lie down on the floor with your back touching the exercise mat. Place your hands below your head in such a position that hands give maximum support to your head and neck. Contract the abdominal muscles and lift one of the legs towards your chest by bending the knee. Lift the shoulder up without giving much stress to the neck. Try to pull the legs towards the elbow and bring them as close as possible. You can also touch them if possible. Come down and change the sides so that alternate legs touch the respective elbow which makes a bicycling movement. It is more or less like pedaling a bicycle but lying flat on the floor. Repeat this exercise for few times giving regular intervals. You can even touch a knee to the opposite side elbow provided that you can stretch upper body in opposite direction. This across movement can provide additional boost to lower and upper abs. Hold the body upright with the support of arms resting on the arm bars and at the same time feet shall be hanged down. Hold the lower back straight with the support of back rest of a chair. Contract abdominal muscles while slowly lifting both the knees towards the chest. Hold this position for few seconds and lower down the legs back to the normal position. Repeat the steps for few times with holding legs towards chest at regular intervals. During this exercise, abdominal muscles get contracted continuously. The reason of this exercise being the best is that it strengthens the lower and upper abs, arms as well as the back. 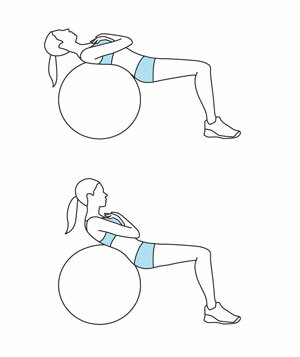 As the name suggests, this exercise needs to be done with the support of an exercise ball. Here are few steps to execute the same. Sit on the ball with stretching the legs downwards. Move your body down on the opposite side and put your hands behind the head. Stretch the lower body towards the legs and curl up as much as possible. Hold the curl up position as much as you can before coming back to the normal pose. Make sure that the ball does not roll away when you curl up so that you can easily attend the normal position. In order to yield the best possible results out of these exercises, you need to have commitment towards their regular execution. Performing these exercises twice in a week is not going to help. You need to do them at least on alternate days if not every day.